Set This Circus Down: ever feel like you wanna share a secret? We're building our dream home! Bryan and I have been working with a realtor since last summer. After viewing many homes in our price point, on Bryan's birthday we stumbled upon a neighborhood 5 minutes from where we currently live. A very southern looking community, which is what we wanted. The neighbors wave to you as you drive by and everyone congregates on their street to chat with a beer in hand as the kids play. After driving by some houses that were for sale in the community, we stopped into the model home to talk with the agent on site. Low and behold, the builder is in their last phase of the community and there are about 15 lots left to choose from. 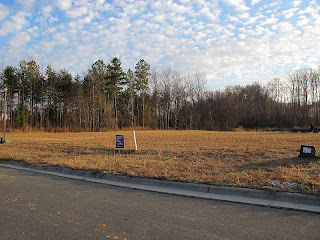 After going back and forth and waying all options, we are officially under contract for Lot 262 -- our desired lot, YAY! We feel so fortunate to be building our dream home! For as long as I can remember I have dreamt of a rocking chair front porch and now my dream is coming true! And yes, I have every step of the way documented! I've blogged it all, I just haven't posted any of them until now. I'll slowly update and before we know it we'll be moving in! Oh, in case you're curious, we had our pre-drywall walkthrough with our builder on Wednesday. Everything went well, so today they begin drywall. By the end of the month all of our cabinets will be installed, EEEK!!! It's getting to be really real! !!! Life is so good !!! OH MY GOSH! That is incredible!!! I wish my husband and I could design our own house but if it does happen, it won't be for many years down the road! We are pretty young :) Congratulations!!! That is amazing! That's awesome! Congratulations to you two! I can't wait to see the pictures!! That's so exciting! Congrats to you guys, can't wait to see the updates! Told you, coolest life! Now you CANNOT, not put the neighborhood for a sister who knows EXACTLY where you live! Where is this house? The Peninsula? Eeeeeek so excited for you!! I cannot wait to watch it all come together! What awesome news ... you are going to have so much fun decorating and moving in! How exciting!!! Congrats! Can't wait to see the house! Soooooooooo excited for you!!! Can't wait to hear and see all about it!!! OMG that is a huge secret you have been keeping!!! How exciting for you two!!!! Yay I'm so happy for you girlie!!!!!!! Kate what EXCITING news...building your dream home!! i can't wait to see (and read) all about it--congrats to you and your hubby on this new adventure! I am new to your blog but love it! Such exciting news too. Good luck on your new adventure! How exciting!!! Congrats to you both and can't wait to start reading all about it! Have a great weekend! How exciting. I have to admit I am a tad bit jealous but I will for sure live out my home building fantasies through you! Congrats!! Congrats on the house! I can't wait to see more pics! I'm a first-time house owner now too! Isn't it a great feeling? That is so exciting! Congrats! Can't wait to see pictures! Congratulations! That is such fantastic news! I cant wait to see youre posts! Now the fun part....DECORATING! Congrats! How exciting!! I can't wait to hear all about it!! Life IS good! What an exciting time for you two. I can't wait to read/see all about it!! That's great Kate! What an awesome "secret" to share with us blog folk!!! Congrats!!! I can't wait to see the house progress assuming you post pics from time to time! that is amazing news! I can't wait to read more about it. Congrats! Oh my goodness. What amazing news!! Thats one of our dreams as well (including the wrap around porch:) Can't wait to hear all about it! That is SOOOOOOOOOOO awesome Kate! You MUST tell me more! how big? basement? upstairs? acreage? SF? I am SO interested! Mainly because Rob and I have been talking about our dream home forever. He knows exactly the floor plan that he wants and now we just need to find the perfect spot to build. Yay! roots! and next step: kids!! Yay, such exciting news!!!! So awesome! I guess you really do love NC! I'm way behind on blogs but finally catching up... that is awesome! Congrats girl!! My parents subcontracted their house when I was 3 and they loved it, it's such a cool feeling knowing that you're the first one to do EVERYTHING within those 4 walls!